CHICAGO – What do you see in the compilation image below? Yes, it’s nine films based on books by romance novelist Nicholas Sparks. But look more closely. “Message in a Bottle” opened his can of worms in 1999 and 2002’s “A Walk to Remember” could only say it was based on a best-selling novel. Then, after averaging one film every 1.6 years, they’ve all been riding on the breakout hit of 2004’s “The Notebook” with Rachel McAdams and Ryan Gosling. 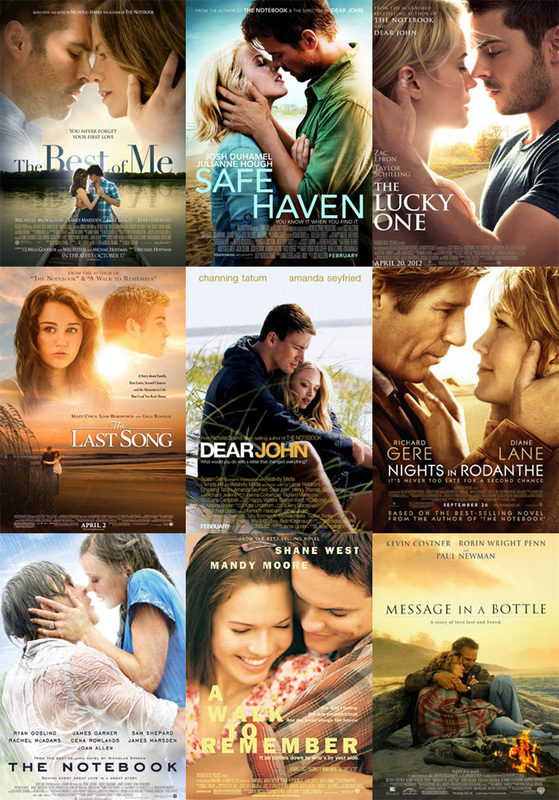 The nine films based on Nicholas Sparks novels with the most recent in the upper left on the oldest in the lower right. In fact, every single movie poster after “The Notebook” had to say it’s from the author of “The Notebook” or else it would have never seen the light of day. The blessing of having a hit later becomes your burden of trying to repeat it. The problem with films based on Sparks’ bestsellers is they have a formula. He’s gotten so adept at writing it that you can practically do it for him. Over the years, critics have been panned these movies for this very reason. Of the nine films based on Sparks’ novels, all of them have earned rotten consensus ratings from critics at Rotten Tomatoes. The box offices tell a different story, though, with all nine of those rotten films making money – many four times their production budgets. “Dear John” in 2010 made 4.5 times its $25 million budget and “The Notebook” earned about 4 times its $29 million spend. Nevertheless, films riding Sparks’ money wave have declined over the years as he’s followed his safety net. “The Best of Me” is the worst offender of this formula yet. When watching James Marsden and Michelle Monaghan artificially fall in love, you can literally see him writing the book. The problem with that is you don’t forget about the writer and you don’t fall in love with the characters. My being “a guy” has nothing to do with my tough love on “these kinds of films”. James Marsden and Michelle Monaghan star in “The Best of Me”. I enjoyed “The Notebook” just fine. But why I’m so hard on films whose sole purpose is to sell you on the chemistry between two people is because so few can actually pull it off. Those that do truly are gems. Comedies are very tricky and they often fail because it’s so challenging to make you consistently laugh for 2 hours. Romance films are equally thorny because they live or die on their ability to make you fall in love with two actors who are trying to sell it. I so rarely feel what romance films are supposed to make me feel, but when it’s real, I know it instantly and so do you. The great ones don’t try too hard, aren’t overly manufactured and aren’t afraid of breaking free of a mold. In “The Best of Me,” you can feel Sparks saying to himself: “I know I haven’t had a hit in a while. It’s so hard to find another one. I could take a big risk and go for a huge hit or flop with this next one, or I could just play it safe again, follow the formula and just get by one more time.” The film doesn’t even just get by, but that’s what it feels like Sparks was trying to do. It feels like he had to keep going – out of financial, professional and contractual necessity – but he’s given up. Luke Bracey and Liana Liberto in “The Best of Me”. If, for reference, you’re wondering what I consider a recent risk-taking, genuine romance film, look no further than 2014’s “The Fault in Our Stars” with Shailene Woodley and Ansel Elgort. After interviewing them for “Divergent” and experiencing their independent, artistic enthusiasm for “The Fault in Our Stars” more than their energy for the blockbuster “Divergent” trilogy, I had high hopes. And indeed, “The Fault in Our Stars” got the job done. I actually felt it. I felt their love, I didn’t feel manipulated and their happiness and sadness all felt very natural. I can say none of that with “The Best of Me”. It’s the epitome of disingenuous, manufactured and manipulative – clearly trying too hard to tug at your heartstrings about long-lost love, second chances, forgiveness and fate. Instead of making you root for this couple, I was left asking myself if the film was instead telling people that marriage is a failed institution and cheating is just fine. What “The Best of Me” has going for itself, though, is yet another satisfactory casting decision. Director Michael Hoffman doesn’t entirely fail in casting James Marsden with Michelle Monaghan. Their chemistry feels contrived because of the unoriginal story they’ve been given. While they feel like robots reading a tired script, though, they make the best of it and do find a few moments of romance your heart can skip a beat to. Perhaps only two or three moments, but if you watch closely, they are there. James Marsden and Michelle Monaghan in “The Best of Me”. But you know you’ve got a big problem when your “A”-list lovebirds playing Amanda and Dawson are outshined by the younger versions of themselves. I find myself remembering Younger Amanda (Liana Liberato) and Younger Dawson (Luke Bracey) even more than their adult counterparts. That budding love felt closer to real because of its desperation. The “Romeo and Juliet” nature of it doesn’t award points for originality. She’s wealthy and he’s from a white-trash upbringing, an abusive father and a cult-like household. Her dad wants to pay him off to not date her. But still, that “eh” story aside, Grownup Amanda and Grownup Dawson needed to lose some of their stuffy maturity and remember what it meant to fall wildly in love as kids. Gerald McRaney as Tuck – or the father Younger Dawson never had – was also an acceptably enjoyable role. His character was actually the film’s closest to one that could be called “well written”. Tuck is selfless, protective, fragile, wise and deadpan, but he’s always got your back. He’s the best dad you’ve never had especially when you’ve had the worst one a kid could get. None of these supporting characters, though, can save this film that will soon be forgotten. “The Best of Me” stars James Marsden, Michelle Monaghan, Luke Bracey, Liana Liberato, Gerald McRaney, Caroline Goodall, Clarke Peters and Sebastian Arcelus from writers J. Mills Goodloe and Will Fetters and director Michael Hoffman based on the novel by Nicholas Sparks. The film opened on Oct. 17, 2014 and has a running time of 117 minutes. It is rated “PG-13” for sexuality, violence, some drug content and brief strong language.